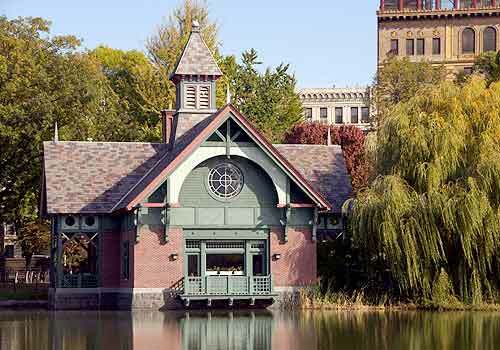 The Charles A. Dana Discovery Center, created in 1993 by Central Park Conservancy, offers a wide variety of free education and community programs, seasonal exhibits, and holiday celebrations. Perched on the northern shore of the Harlem Meer, the Dana Center is Central Park's newest building, and the first to be built specifically as a visitor center. Adjacent to the Center is a small plaza, where many community programs take place. These include the Harlem Meer Performance Festival in summer, the Halloween Parade and Pumpkin Flotilla in autumn, and the annual Holiday Lighting event in winter. The Charles A. Dana Discovery Center is also the home of our catch-and-release fishing program. Groups: Reservations are required for Discovery Kits, Fishing, and Exhibit visits for groups of 5-30 people. Request a Group Reservation. Are you an educator? Learn about additional volunteer and education opportunities for school groups at our Visitor Centers.